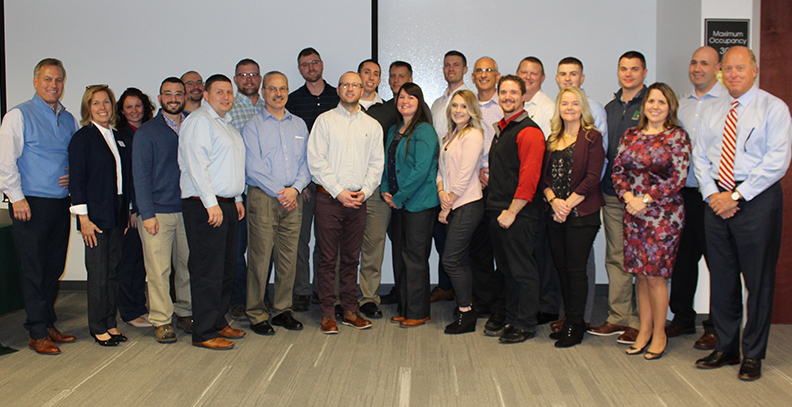 By Jeanne Eason December 7, 2018 Armonk, N.Y., Binghamton, N.Y., Buffalo, N.Y., Community, Corning, N.Y., Rochester, N.Y., Syracuse, N.Y.
On November 28, 19 LeChase employees graduated from a pilot program designed to build professional and personal leadership skills. Held in partnership with Dale Carnegie training, Building the Leaders that Build our Future involved eight working sessions held over a four-month period. Although the sessions were held in Rochester, attendees – nominated by their SBU/FBU leaders – came from a variety of functional groups and operations across New York. In addition to leadership skills, topics covered in the class included people skills, leading meetings effectively, communications, self-confidence, reducing stress and achieving work-life balance. At the final session, each graduate spoke about a class topic that had special meaning to them, and they took turns introducing other speakers. Building Leaders graduates and instructors pose for a class photo with CEO Bill Goodrich (far left) and President Will Mack (far right). Given the success of the initial class, Cheryl Schmidt, director of organizational development at LeChase, is looking to host a second program in 2019. Congratulations to all of the 2018 Building Leaders graduates: Kirk Armstrong (Binghamton), Jay Burdin (Corning), Sal Casuccio (Preconstruction), Dan Christoffersen (Binghamton), Kevin Clark (Syracuse), Robert Donnelly (Syracuse), Jim Finan (Armonk), Rene Giannavola (Rochester), Matthew Herbert (Syracuse), Steven Hinkley (IT), Larry Johnson (Corning), John Koch (Rochester), Phil Koff (Rochester), Mike Messina (Preconstruction), Evan Owens (Finance), Monica Stengel (Finance), Katie Vaccaro (Legal), Ann Van Auken (Risk Management) and Andrew Weiner (Armonk).